The past few generations of mid-range and budget Windows Phones haven't been particularly amazing, and it seems like Microsoft wants to continue that trend, with the company currently readying the Lumia 650 as a new entry-level smartphone. 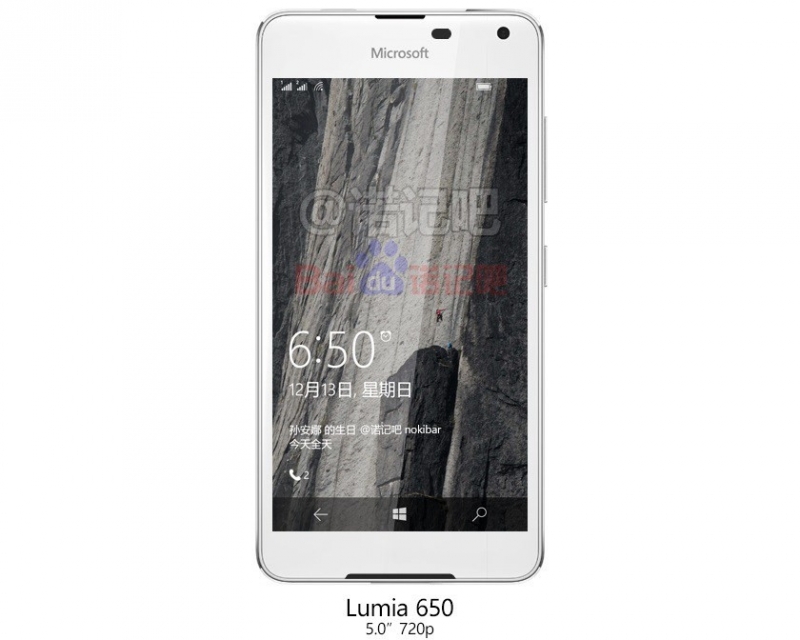 A render of the Lumia 650 has leaked via Teiba, revealing an uninteresting design that's a basic iteration of past Lumia handsets. The picture suggests the phone will feature a front speaker and dual-SIM connectivity, although not much else can be determined from a simple image of the device's front. Rumored specs for the Lumia 650 include a 5.0-inch 720p display, a Snapdragon 410 SoC, 1 GB of RAM and 8 GB of internal storage. Again, these specs aren't revolutionary in the budget segment at all, so Microsoft will face some stiff competition against the likes of the Motorola Moto G 2015 and Asus Zenfone 2. Compared to Microsoft's other recent budget Windows Phones, the Lumia 550, you're getting a faster SoC (up from a Snapdragon 210) and slightly larger display (up from 4.7-inches) if you choose the Lumia 650. Camera info hasn't been revealed, but nothing about the Lumia 650's other specifications suggests it will be particularly amazing. There's no word on when Microsoft might officially reveal the Lumia 650, though you can expect it will launch with Windows 10 Mobile on board. Considering we're already seeing renders of the device in the wild, it's looking likely that the phone will be announced in the early parts of next year, possibly at MWC 2016.